How Best to Fight Climate Change? After having fewer children, your next best actions are selling your car, avoiding flights and going vegetarian. These activities reduce emissions many times more than common green activities, such as recycling, using low energy light bulbs or drying washing on a line, according to a study into the true impact of different green lifestyle choices. Carbon emissions must fall to two tonnes of C02 per person by 2050 to avoid severe global warning, but in the US and Australia emissions are currently 16 tonnes per person and in the UK seven tonnes. ‘That’s obviously a really big change and we wanted to show that individuals have an opportunity to be a part of that,’ said Kimberly Nicholas, one of the research team at Lund University in Sweden. The study, published in Environmental Research Letters, sets out the impact of different actions on a comparable basis. By far the biggest ultimate impact is having one fewer child, which the researchers calculated equated to a reduction of 58 tonnes of C02 for each year of a parent’s life. Overpopulation is a controversial factor in the climate change debate, with some pointing out that an American is responsible for 40 times the emissions produced by a Bangladeshi and that over consumption is the crucial issue. The researchers analysed dozens of sources from Europe, North America and Japan to calculate carbon savings that individuals in richer nations can make. 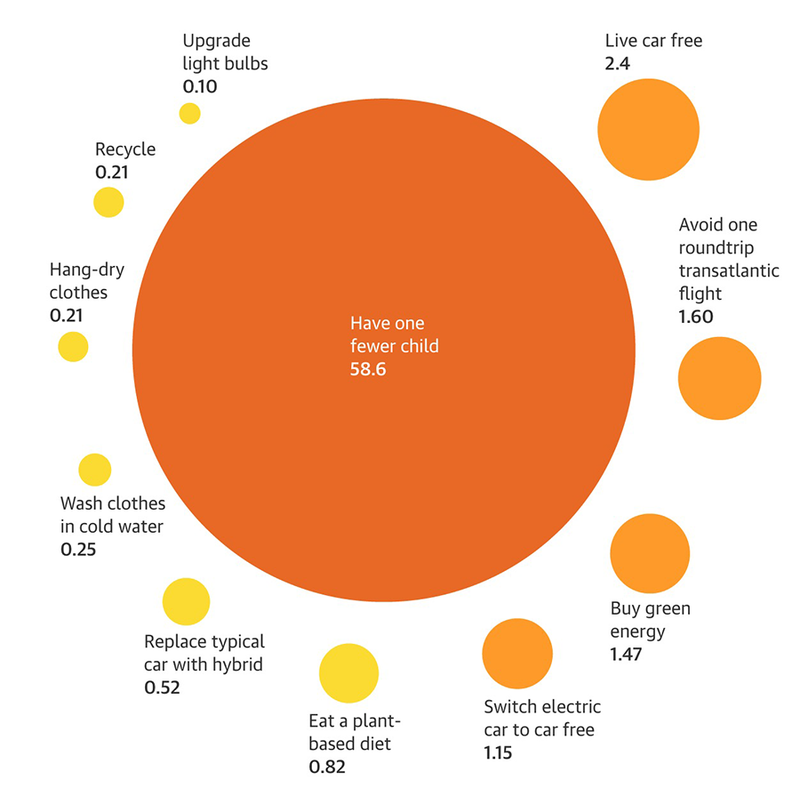 Getting rid of a car saved 2.4 tonnes a year, avoiding a return transatlantic flight saved 1.6 tonnes, becoming vegetarian saved 0.8 tonnes a year. The researchers found that government advice in the US, Canada, EU and Australia rarely mentioned the high impact actions, with only the EU citing eating less meat and only Australia citing living without a car. None mentioned having one fewer child.